This is probably the most important part of the IEP process, as it helps the team understand the child’s strengths and needs. What is a comprehensive evaluation plan? The school district must assess your child in all areas of suspected disability. These assessments must be done at least every three years (commonly known as the “triennial”) but more often if there has been a change in skills (e.g. improvement or regression), during times of transition (e.g. when the child is transitioning to kindergarten), or when a parent requests evaluation. Evaluations cannot be done more than once a year. Do I need a letter from my child’s doctor to get a comprehensive evaluation plan from the school? No, but it is helpful if your child’s neurologist or neurosurgeon writes a letter to the school which explains what can happen after epilepsy surgery. We have several letters here depending on the type of surgery your child as had. What assessments should be in a comprehensive evaluation plan? Assesses the child’s visual acuity, auditory acuity, collects information for a seizure plan and hydrocephalus symptom awareness plan. This assessment is often performed by the school nurse. Assesses the child’s academic skills in pre-reading/reading, math, and writing, including oral expression, listening comprehension and written expression. This assessment is performed by the school psychologist. Assesses the cognitive functions impacted by the disconnection surgery. Aspects of cognitive functioning that are assessed typically include attention/concentration, language processing, visuo-spatial perception, verbal learning and memory, visual learning and memory, speed of processing, sensory-perceptual functions, motor speed and strength, motivation/symptom validity, orientation, learning, memory, intelligence, language, visuoperception, and executive function. This evaluation is very different than the psycho-educational evaluation performed by the school psychologist because it is more detailed in nature and focuses on how the child’s brain function affects his/her cognitive and behavioral function. Assesses the child’s literacy/pre-literacy skills, including phonological awareness, phonemic awareness, vocabulary, comprehension, and fluency. Research after hemispherectomy shows that children often struggle with several domains of literacy skills while maintaining individual strengths. This requires “flexible literacy instruction based on standardized assessments that analyze individual strengths that are used to generate intervention strategies.”1 These assessments should be performed by a Certified Reading Specialist or school psychologist and may sometimes be incorporated in the educational evaluation, the neuropsychological evaluation, or the psycho-educational evaluation. Assesses how the child uses vision (limited by the homonymous hemianopsia caused by the surgery and other cortical vision impairment which may be a result of the underlying condition which caused the seizures) in everyday life and identify areas of concern in safety, navigation, and reading, for example. After hemispherectomy, components should include: 1) visual acuity; 2) field of vision; and 3) contrast sensitivity. This assessment is usually performed by the Teacher for the Visually Impaired. Parents and school districts should understand that homonymous hemianopsia is a type of cortical vision impairment. The Perkins School for the Blind gives a great summary of how homonymous hemianopsia affects a child in school here. Assesses how homonymous hemianopsia affects the child’s ability to travel safely both indoors and outdoors, with or without assistance, in static and dynamic environments, and consider sensory, navigational, visual, and mobility skills. 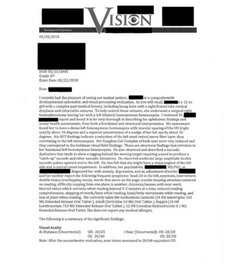 This is typically performed by a Teacher of the Visually Impaired and may be included in the functional vision assessment above or may be a separate assessment. Assesses the sensory integration processes that underlie learning and behavior. Children after hemispherectomy and similar disconnective surgeries require a comprehensive evaluation of their sensory needs, including proprioception, self-regulation and self-modulation. Hemispherectomy surgery removes the somatosensory cortex of one side of the brain, which can result in sensory processing issues. This assessment is usually performed by an occupational therapist. Assesses the child’s locomotor skills and object control, specifically in the areas of fine manual control, visual-fine motor skills, body coordination, ambulation, balance and vestibular reflexes as well as strength and agility. This assessment is typically performed by the school’s physical therapist. Assesses the child’s speech, articulation, spoken/non-spoken language, pragmatics, and communication skills. This assessment is typically performed by a speech pathologist. Assesses what aids and devices can help the child access to curriculum, and to minimize the academic demands on the child via these resources if possible so as to free up cognitive resources for richer learning. 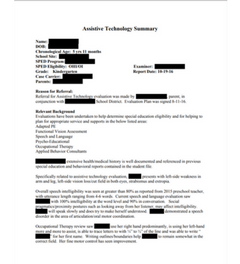 This assessment is typically performed by a certified assistive technology professional. Assesses what aids and devices can help improve the child’s communication. This is not limited to non-verbal children only. Communicative competence can be a struggle even for those who speak. This assessment is typically performed by a certified assistive technology professional or speech-language pathologist. Assesses the child’s ability to participate in the school’s physical education program and access the school environment, especially related to health and well-being as well as functional gross motor skills training in relation to mobility and play, endurance and conditioning programs for physical fitness, balance, body awareness, environmental adaptations, accommodations, and adaptive techniques. This assessment is typically performed by a certified adaptive physical education therapist. Assesses the purpose/reason for behaviors displayed by children with cognitive or communication challenges. 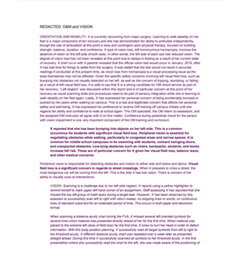 This assessment includes a parent questionnaire and is usually completed by the school psychologist or behaviorist. Assesses whether the child’s disability may be serious enough to warrant special mental health and therapeutic interventions to enable him to make friends and socialize appropriately. You should request a comprehensive educational evaluation in writing and send it to the special education director for your district. We recommend that you take two copies to the special education office – leave one copy for the school and ask the school secretary to date stamp and sign your copy. You can also email it to the director or IEP contact. 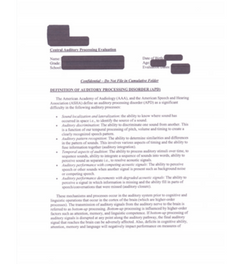 Some states require special forms when requesting an evaluation. Make sure you check whether your state requires a separate form. 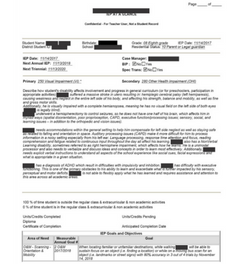 Our sample letter requesting a comprehensive evaluation after hemispherectomy contains more information than would typically be included in a request letter, however, the information is important so that school district personnel understand the complexity of the functional impact the procedure has on the child. Feel free to delete the assessments that your child does not need or is too young to complete (e.g. not all children will need a mental health assessment; central auditory processing assessments may be difficult for a child less than 7 years old). A letter from your child’s neurologist or neurosurgeon which outlines functional challenges after surgery is also helpful to the team. We have several here for you. What If The School Does Not Assess In All Areas Of Suspected Disability? 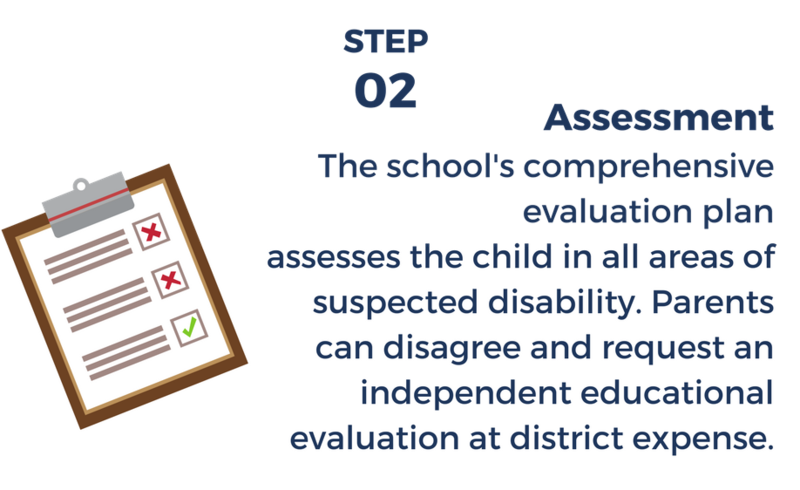 A school district must assess a child in “all areas of suspected disability.” If they do not have on staff the appropriately credentialed person to perform any of the assessments, they must hire someone to perform the assessment. “We don’t do that here” is not a valid response to a parental request for assessment. If your child was assessed in some areas, but you now realize that other assessments are needed, you do not need to let the school assess your child in those areas. The school only gets “one bite at the apple” (See this letter from the U.S. Department of Education which addresses this issue.) You can request an independent educational evaluation (see below) in the areas that were not assessed. What If The School’s Assessments Were Inadequate or Incorrect? If you disagree with the school district’s assessments (for example, they were inadequate or incorrect), you need only tell the district that you disagree with them and request an independent educational evaluation. You can request an independent educational evaluation (IEE) by simply stating that you disagree with the school’s assessment(s). Similarly, if you have reviewed the assessments and disagree with their conclusions, testing methods used, or other areas, you may also request an IEE for those assessment areas. You get to choose the independent evaluator subject to the school’s requirements for assessors. You are not required to choose only from their list of approved assessors. Understand, however, that if the school district pays for the independent educational evaluation, they are entitled to see that evaluation even if you disagree with the results therein. Once the school district receives your IEE request, they must either FUND the independent assessments or FILE due process against YOU! 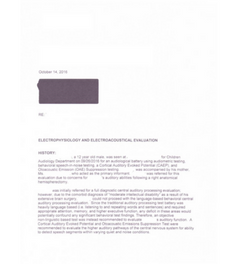 Use your IEE request wisely. 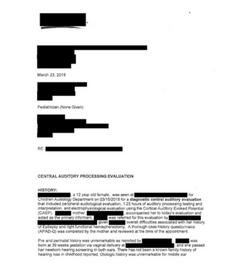 If you ask for too many independent assessments, you may increase the chances of a due process filing against you. If you can afford to have your own private assessments done, or have insurance that will cover the assessments, you should have them done. Federal law requires school districts to consider private assessments. How Do I Find An Independent or Private Evaluator? American Academy of Audiologists – click here to search for an audiologist in your area. You should make sure to ask if they have equipment to test for central auditory processing disorders. Academy of Neurologic Physical Therapists – we recommend that you first attempt to find a pediatric physical therapist in your area with a neurologic specialist certification. You can search at the American Physical Therapy Association – click here to search for a pediatric physical therapist in your area. The assessments are arguably the most important part of the IEP process. Understand the various assessments that are needed. If you can afford to pay for any assessment to be performed by a private evaluator, this is where to spend your money. Be sure to ask the private evaluator to include intervention strategies and recommendations for the supplementary aides and services your child should have at school. Take a moment to watch these webinars presented by Audrey Vernick, our Director of Education Advocacy and Training. These webinars from the Family Voices of California are intended to provide information to help parents and professionals advocate for special education programs and services for children after brain surgery.